From Northern English or Scottish, of Old Norse origin: compare reynir; compare Norwegian rogn, Danish røn. Ultimately related to the root of red. 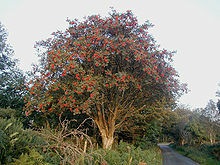 Sorbus aucuparia, the European rowan. Any of various small deciduous trees or shrubs of genus Sorbus, belonging to the rose family, with pinnate leaves, corymbs of white flowers, and usually with orange-red berries. Sorbus subg. Sorbus on Wikispecies. From Proto-Germanic *rōaną (“to row”), from Proto-Indo-European *h₁reh₁- (“to row”). Akin to Old Frisian *rōia (West Frisian roeie), Middle Dutch royen (Dutch roeien), Old Norse róa (Danish かつ Swedish ro).